Jiwanggu is located 40 kilometers away from the northwestern part in Yishui County of Shandong Province. 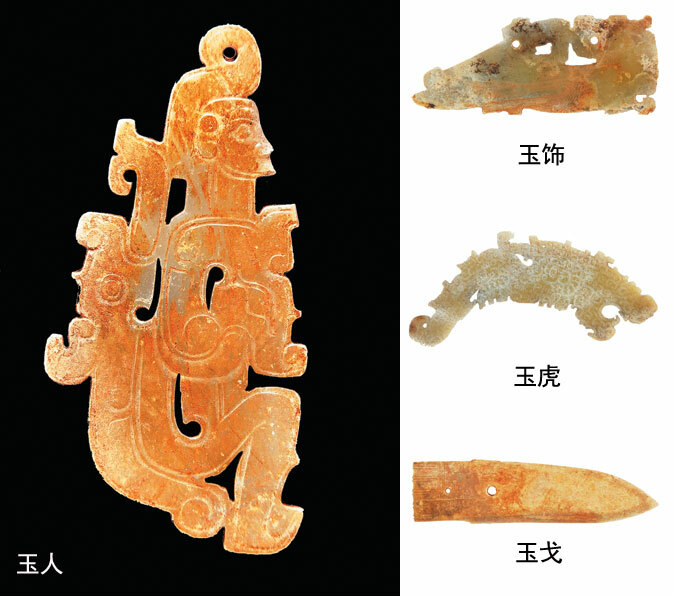 The enormous amount of findings, the wealth of detail information gained, the specific structures unearthed as well as the clear dating of the burial can be regarded as one of the most important archaeological discoveries of East Zhou period in Shandong. 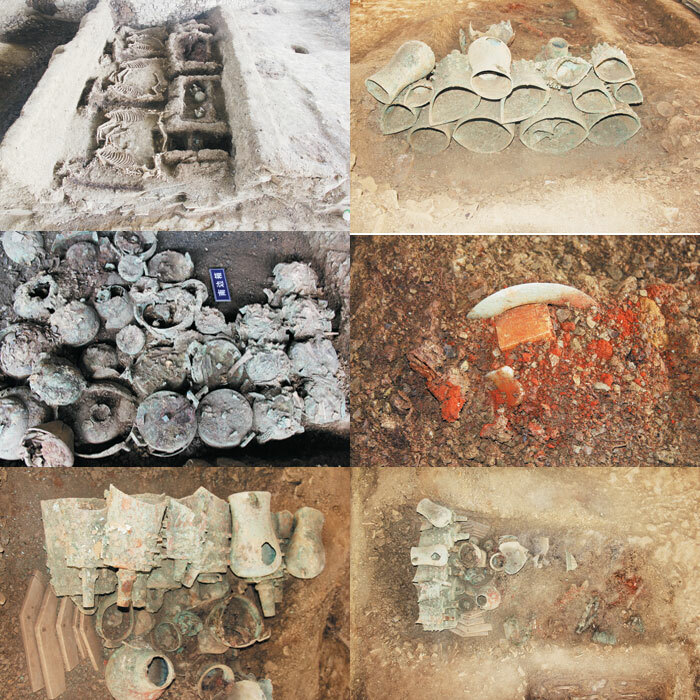 The Cultural Relic and Archaeological Institute of Shandong Province together with the local cultural heritage department formed an archaeological team to conduct a rescue excavation from February to July 2012. The typology of the burial was special with tomb and chariot pit combined within one limestone pit. The northern and eastern parts of the burial were heavily disturbed, but parts of the main chamber have been preserved in relatively good condition. Based on the assessment of the remaining part, the shape of the burial ground was rectangular. Its overall length was 40m from north to south and 13m wide measuring from east to west. The southern portion comprised the burial chamber and the northern portion was a chariot pit. The burial was rectangular limestone shaft tomb with a long passage leading to a wooden chamber, which was formed by three components namely chamber, passage and chariot pit. The plan of the burial was rectangular with slanted walls. The second-tier platform of the western part was preserved in good condition, whereas the one of the eastern part was seriously damaged. The passageway from a south-easterly direction led down towards the burial. The central area of the burial was formed by an outer coffin and the inner rectangular coffin room with 3.26m in length and 1.94m in width. A side box was identified in each the southern and northern portion of the inner coffin. Three other funeral murders were arranged in between the inner coffin and the side boxes as well as on the western side of the coffin chamber, whom own one coffin respectively. The coffin chamber had multiple coffins. The wooden materials of the outer coffin had deteriorated and only wooden ash and fallen paint remained. The outer coffin was rectangular in shape with a length of 2.5m measuring from east to west and a width of 1.35m. The inner coffin was also rectangular, 2.25m long and 1~1.04m wide. It had heavily deteriorated but was originally colored in thick red and black paint. A 6cm thick layer of cinnabar covered the bottom of the coffin. However, the human skeleton had disappeared and only some degenerated grayish-white powder was identified near the head area. It is believed that these were the traces of the burial owner’s skeletal remains. Judging from these traces, headdress and accessories, the burial owner was laid to rest in an unknown position with his head facing east. Large amounts of cinnabar were identified around the skeletal remains of the buried. A relatively large number of jade ornaments including cong tube, halberd, tiger, figurine, xi, huang pendant, ring, slotted ring, pendant, etc. were identified around the owner of the burial. Besides, agate and turquoise beads were also found. Remains of a dog were also discovered in the inner coffin. Three other funeral murders had been carefully arranged within the inner coffin and on the northern, western and southern side. Each person had its individual wooden coffin. The heads of the persons on the southern and northern side were facing east, while the one on the western side was facing east with the head to the south. A copper boat was also identified on the lower left limb of the southern person. The wood of the side box on the southern side had deteriorated. The length measured 3.6m from east to west and 1.7m from south to north. A 5-9cm thick layer of mainly animal ribs and limb bones was found. Below it was another layer consisting of bone fragments from small animals such as fish. Parts of the fish bone were intact. Other burial items identified within the side box included pottery, copper tools, and lacquer ware. Copper items included ding tripod, li tripod, fu receptacle and lei vessel (seven of each) and three copper dun receptacle. In addition, there were five copper xiuding tripods. However, only seven pottery vessels were identified. However, all lacquer wares found in the burial had deteriorated and their shapes could hardly be identified. The wooden box on the northern side had a remaining length of 3.46m measuring from east to west and a width of 1.6m from north to south. Two copper dun receptacle, a set of nine yong bells, a set of four bo bells, a set of nine knob bells, a set of ten stone pans, four copper boats, copper zheng, copper yan vessel, copper lei vessel, copper containers, copper basins, a copper yi (vessel) and an ancient se (musical instrument) were identified. Other than that, a copper sword, yue axe, jin chopper, arrowheads and chisels were discovered. The second-tier platform in the eastern chamber was damaged and only the southeastern corner remained. The second-tier platform in the west was complete and the base was being burned, in which some portion formed red burnt soil layer. Large amounts of animal skeletons, teeth and broken pottery fragments were identified. The chariot pit was located in the northern part of the burial but was also severely damaged. The remaining length measured 7.5m north to south and the upper width was 4.1 to 4.4.m east to west; the base width was 3.6m measured east to west. There were remains of altogether four chariots, of which the two in the centre were in good condition, while the chariots in the north and south were severely damaged. The chariots were single shaft carriages combined with a pole, suspension beam, axle and wheels. Each chariot was drawn by two horses. Their skeletal remains were intact, but the wooden carts had heavily deteriorated. An ornament and a cheekpiece were put on top of the horses head. In addition, a circle of copper beads surrounded their necks. A yoke was identified at the pole. A number of bronze ritual artefacts including ding tripod, ge dagger and dun receptacle were identified within cart No. 2, which was a rare phenomena. According to artefacts and burial style, the tomb was dated to Spring and Autumn Period. The discovery of the burial provides valuable evidence for dating the surrounding features.